This highly versatile portrait reflector kit allows one, two or three reflector panels, to be individually positioned around the model to give the lighting effect required. The kit comes complete with one Silver/Gold and two Sunlight/Silver reflectors. The three multi-angle joints can also be used to mount any of the reflectors individually onto a lighting stand. 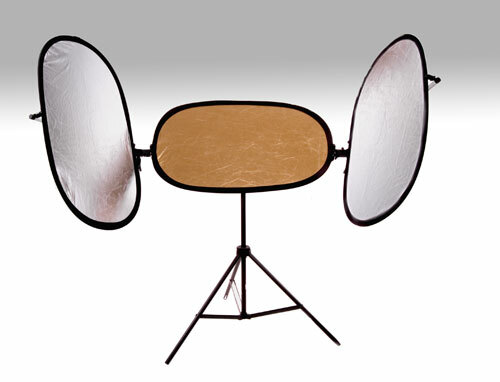 Each reflector measures 90x60cms (36"x24") making the reflector kit suitable for both individual or group portraits. The fully adjustable reflector frame will fit onto a standard lighting stand.